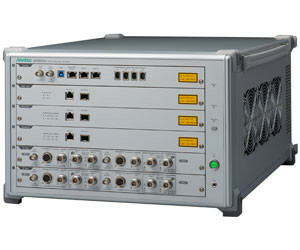 Anritsu has released its MT8000A solution with a 5G base station emulation function. The product supports 5G NR RF Tx measurements and protocol tests needed to support advances in communications technologies in line with the development of 5G NR. A single MT8000A test platform supports both the sub-6 GHz, including band n41, and the millimetre wave bands used by 5G. Combining it with the OTA Chamber enables both millimetre wave band RF measurements and beamforming tests using call connections specified by 3GPP. The flexible, scalable design uses a modular architecture. As well as supporting 4x4 MIMO and 8CA implemented by eMBB (enhanced mobile broadband), it provides a flexible environment for future 5G test requirements, including URLLC (ultra-reliable and low latency communications) and mMTC (massive machine-type communications). A comprehensive test environment is provided by making use of Anritsu’s LTE test platform offering innovative functions based on the company’s experience in this market. Easy configuration of a linked environment is possible for simulating 5G and LTE NSA (non-standalone). 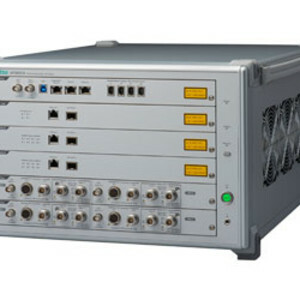 I am interested in Anritsu MT8000A Test Platform for 5G NR RF & Protocol Test .